That's me in 1983. 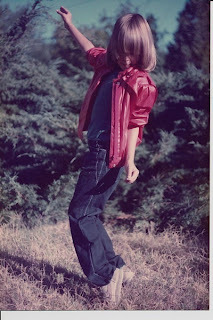 Six years old, and doing my best Michael Jackson. And that is my red (p)leather jacket. I loved the hell out of that jacket. In my mind it wasn't some flimsy knockoff plucked off a Gemco shelf. To me, that thing was magic. When I slipped it on, I was Michael Jackson in Thriller. I could sing like him. I could dance like him. That red jacket was my Dumbo's feather. There was no stopping me when I had it on. I channeled all the cool of my childhood hero and coupled it with the unbridled confidence that only a six year-old is capable of. I was unstoppable. What I wouldn't give some days to have just a touch of that magic back. Though this time around I'd probably choose something other than a shiny red leather jacket as a conduit. Nah, there's nothing better than a red (p)leather jacket. Stick with what works. haaaa! that picture is so great, it was totally worth risking stuck-in-my-head syndrome!! love it! you know we are going out to boogey now, right? i didn't know you had the boogey in you. but you clearly do. Martha, if you don't mind being seen with someone who's boogey is straight out of 1983, then count me in.